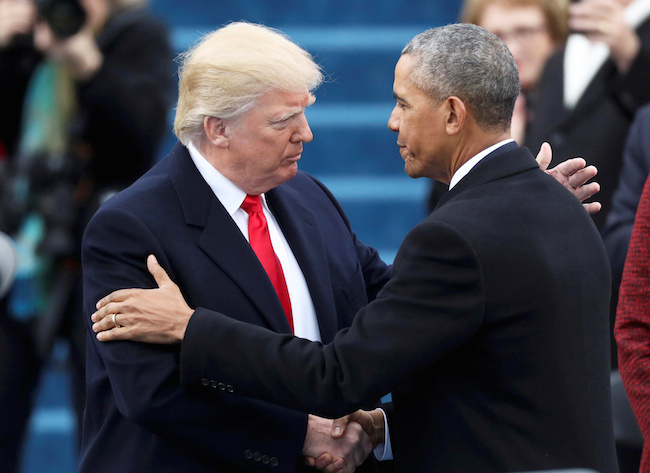 President Trump’s claims that the Obama administration sought to undermine his presidency received some support on Wednesday from a New York Times report on the Obama White House’s activities in the weeks before the inauguration. According to The Times, Obama White House officials waged a campaign to procure, save and disperse classified intelligence regarding Trump associates’ contacts with Russians. The campaign also involved curtailing the Trump team’s access to highly classified information and of lowering classification ratings on other information about the ongoing Russia investigation so that it could be more widely shared across the government. According to The Times’ sources, the Obama officials waged the campaign out of fear that the Trump administration would cover up or destroy some of the information. The campaign was multifaceted but was not directed by Obama himself, the Times sources claimed. The wide-ranging report also includes some information that is not positive for Trump, including that federal investigators were given intelligence from foreign services that some Trump associates met with Russians in the Netherlands and Britain. That detail adds new information to a report from The Times last month that U.S. investigators had evidence that some Trump campaign advisers communicated with Russian government officials before the election. The Obama administration’s intelligence-sharing effort involved the White House, intelligence agencies and State Department, The Times reports. According to the newspaper, some Obama White House officials asked specific questions in intelligence briefings because they knew the questions and answers would be documented and saved for future review. Intelligence agencies ramped up efforts to convert raw intelligence gathered on Trump advisers into information that could be used by analysts. The intelligence was also classified at relatively low levels “to ensure as wide a readership as possible across the government,” according to The Times. The State Department, then led by John Kerry, also took part in the intelligence-sharing campaign. The agency sent a batch of documents classified as “Secret” to Maryland Sen. Ben Cardin, the top Democrat on the Foreign Relations Committee, just before the election. The scheme would seem to lend support to Trump’s claims that the Obama White House sought to undermine his presidency by leaking classified information. “I think that President Obama is behind it because his people are certainly behind it. And some of the leaks possibly come from that group, which are really serious because they are very bad in terms of national security. But I also understand that is politics. In terms of him being behind things, that’s politics. And it will probably continue,” Trump told Fox & Friends in an interview this week. Trump has alleged that Obama appointees still working in the government have leaked information about some of his phone calls with foreign leaders and about Michael Flynn, the former Trump national security adviser who resigned last month because of phone calls he had with Russia’s ambassador in December. The Times report provides new details about the information being reviewed as part of the expansive investigation into Russia’s attempts to influence the election. The Times notes that the nature of the meetings was not clear to the intelligence officials. The intercepted communications also provided little useful information. Notably, The Times did not report the names of the Trump advisers and Russians who were allegedly involved in the discussions. It is unclear whether the Times’ sources provided the names, and if so, why they withheld the information. White House spokesman Sean Spicer dismissed the claims in a statement to The Times. “The only new piece of information that has come to light is that political appointees in the Obama administration have sought to create a false narrative to make an excuse for their own defeat in the election. There continues to be no there, there,” he told the newspaper.